1. To condemn the State Peace and Development Council for its violation of all forms of Human rights particularly the use of forced labor suppression against the workers in Burma. 3. 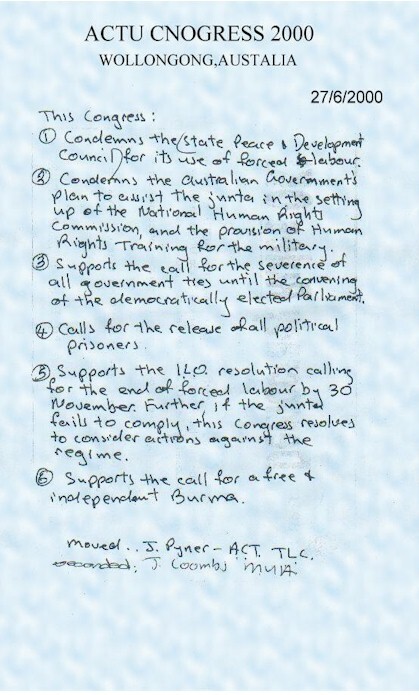 To Condemn Australian Federal coalition government plan to assist the regime in setting up" National the Human rights Commission " and to provide Human Rights training for the military regime in Burma and call for immediate cancellation of the plan. 4. To organize Global Action Day jointly with Free Burma Action Committee which is Burmese community based campaign committee targeting SPDC embassy in Canberra on November 30, 2000 as deadline made by International Labor Organization to stop forced labor in Burma. Urge the ICFTU to initiate internationally concerted action on Nov 30. 5. To launch industrial Action against the Australian companies doing business with Burmese military regime and SPDC offices in Australia. Actions include picketing and boycotts etc. Actions will be varied in each state on different targets and dates on yearly basis. 6. To call for Federal government to cut all ties including trade and political, with oppressive military regime until democratically elected parliament is convened. 7. To call for United National and International institutes to unseat SPDC regime and replace with democratic legitimate representation CRPP. 8. To demand SPDC regime to free all 3000 political prisoners including tT Aye Thar Aung the secreatrv of CRPP , Dr Saw Mra Aung the Speaker of the unconvened Parliament and 50 members of Parliament-elect. 9. To intensify ACTU campaign for a free Burma, and help to promote and strengthen workers union in Burma.